To reserve a spot on this painting holiday for 2019 please do so at my Shop-Now section and click “Art Holidays” or email artist@nikkisportraits.com before Sept. 15, 2018 to reserve the EARLY BIRD RATE and SAVE $300. CAD + GST! A $550. + GST deposit CAD reserves your space! The registration deadline is Nov. 11th, 2018. (Max. 11 students) Jan. 11 – 25th, 2018 The cost of this package is $1090. US + your choice of accommodations + GST. Does not include flights and some meals. Please call Nikki at 1-877-335-7655 toll free for further details. See the pricing and conditions brochure below for full details. Learn to paint and draw on holiday in Cuba this winter, beginning with a 1 night stay in a Santa Clara casa particular (B&B). Next we will take a per-arranged transfer through the picturesque Escambray Mountains by day to our next destination: Trinidad, Cuba for a 6 night stay in a local casa particular. Trinidad is a UNESCO World Heritage site where you will experience Spanish colonial era architecture unlike anywhere else in the country. From Trinidad we will also travel out to paint gorgeous valley vistas, the Topes de Collantes Waterfalls, Playa Ancon Beach on the Caribbean Sea and much more. 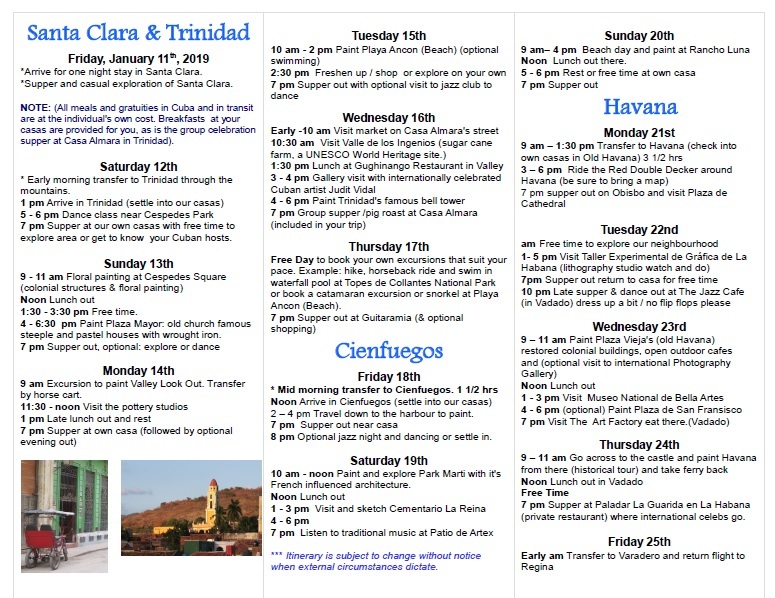 Discover historic sites and Cuban art, dance and music in this area while learning to paint plein air in watercolour and acrylic. We will also learn to use our sketchbook as a tool to creativity. Also we will have an opportunity to visit two Cuban artists’ studios. Next we will take another per-arranged transfer to Cienfuegos to stay for 3 nights to explore the French influenced architecture. 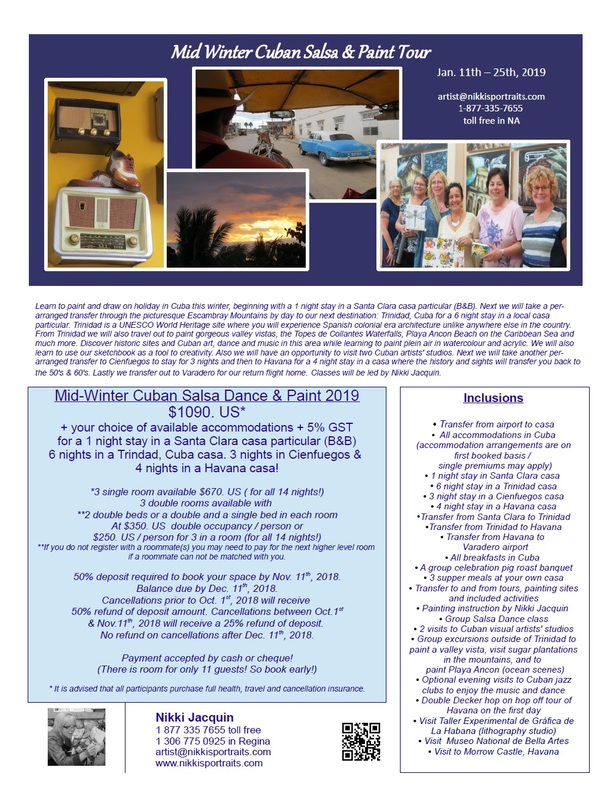 Then we are off to Havana for a 4 night stay in a casa where the history and sights will transfer you back to the 50’s & 60’s and we will connect once again with an artist friend there. Lastly we transfer out to Varadero for our return flight home. Classes will be led by Nikki Jacquin. See printable PDF’s at the bottom of this post!